People who really care about the ritual of coffee drinking will confirm it’s not always all about the coffee. If you are a real coffee lover, you’ll certainly pay attention to the mug you drink your coffee from, as well. That’s why heat sensitive coffee mugs have gained incredible popularity ever since they appeared on the market. Nowadays, you can find some really interesting heat sensitive coffee mugs. For example, they may feature your favorite movie or comic book character, or a landscape you like. Moreover, you can even have a completely customized one, with a personalized message, or a picture of a dear person! If you’d like to know more about these coffee cups that change color with temperature or you’re thinking about buying one, read on. We’re about to show you some of our favorite mugs you’re going to love! However, before we move on to showing you these gorgeous mugs, let’s briefly explain what heat sensitive coffee mugs are and how they work, for those of you who may not know it. 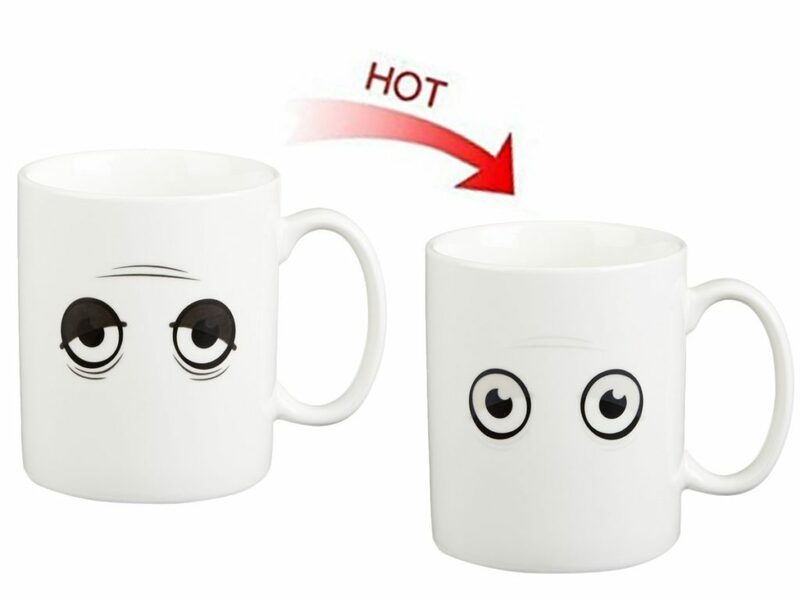 Basically, a heat sensitive mug is the kind of mug that changes its appearance once you pour the hot liquid into it. How’s that even possible? The main secret of this color change effect lies in the usage of inks and dyes that are sensitive to the changes of temperature. These special inks and dyes belong to the organic chemicals known as leucodyes. Before pouring hot liquid in it, a heat sensitive mug is either transparent or in a particular color. Once you pour your coffee into it, the image will become visible or they’ll change the color due to the temperature rise, depending on the type of mug. 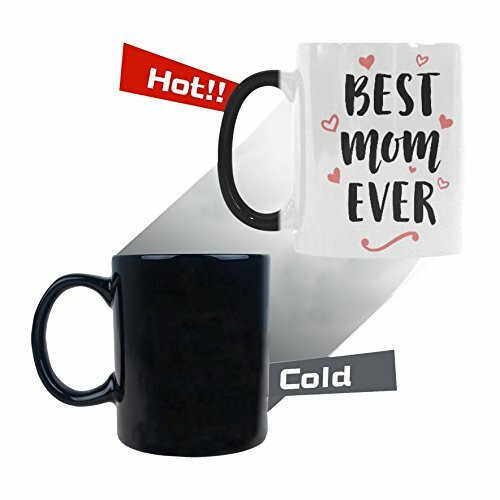 We chose the most beautiful, most interesting, cutest, sweet, funny color changing cups that you can buy online for yourself or as a gift for someone. 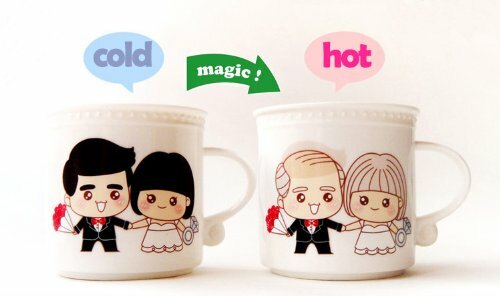 Maybe someone likes a different type of coffee mug but we are still young at heart and we love this magical mugs. 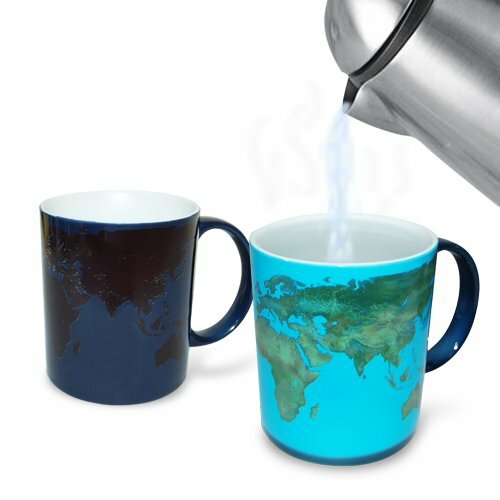 Now, let’s see some of the most interesting heat sensitive mugs on the market! This mug is definitely one of the best ways to start your day in a great mood before even tasting your coffee. Before you pour your coffee, it will appear perfectly regular – elegantly black with a thin line in the central area. 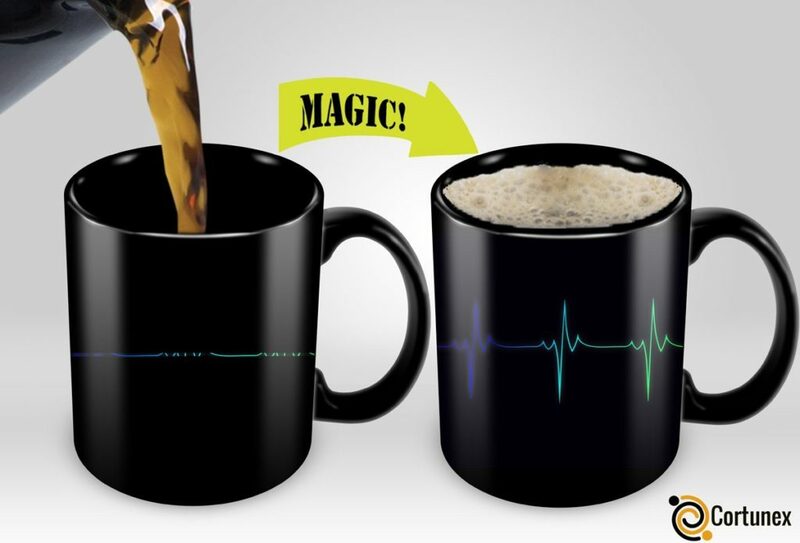 However, the fun starts when you start pouring your hot coffee because the simple black line becomes an electrocardiogram! You need to know that all this temperature sensitive mugs are not dishwasher safe. For coffee supremacy team coffee means life and and without coffee we would not have survived. 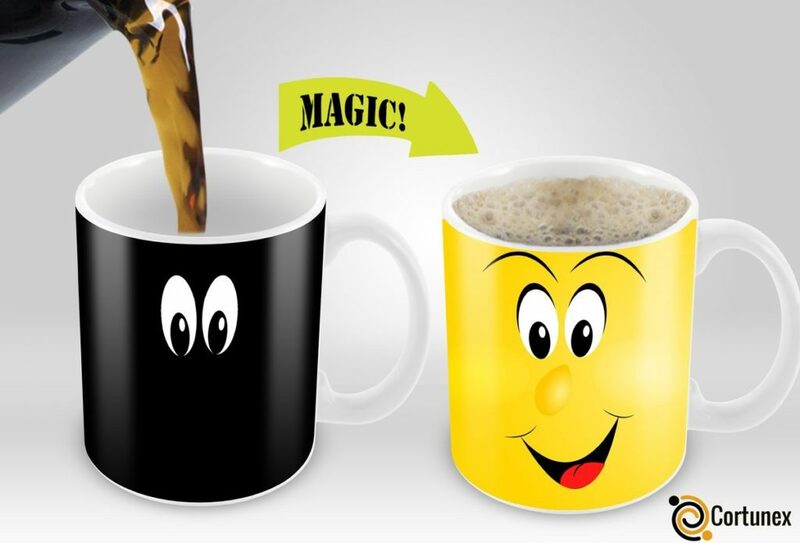 This magic mug very simple explains how much coffee means any coffee lover. 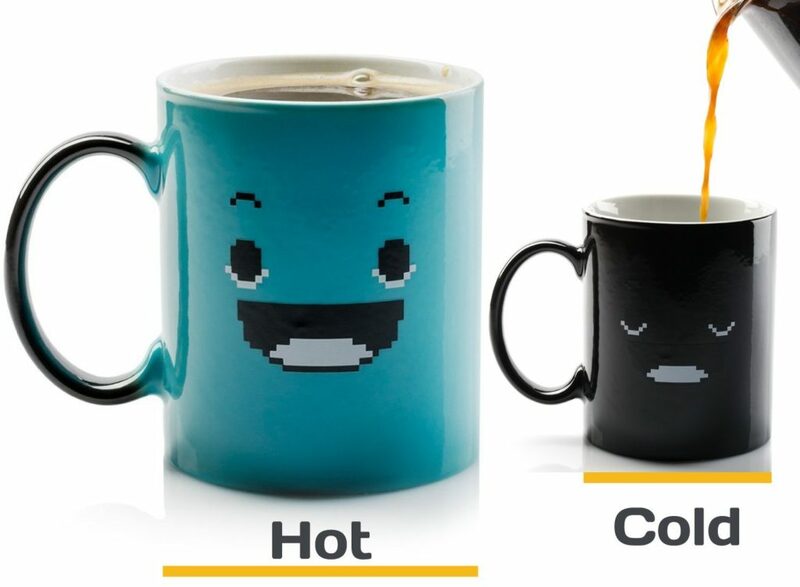 Great gift for every coffee fan who know difference between cold and hot coffee. Have you ever observed your face in the mirror before and after drinking your first coffee? If not, this heat reactive coffee mug will perfectly show you the flow of your mood. 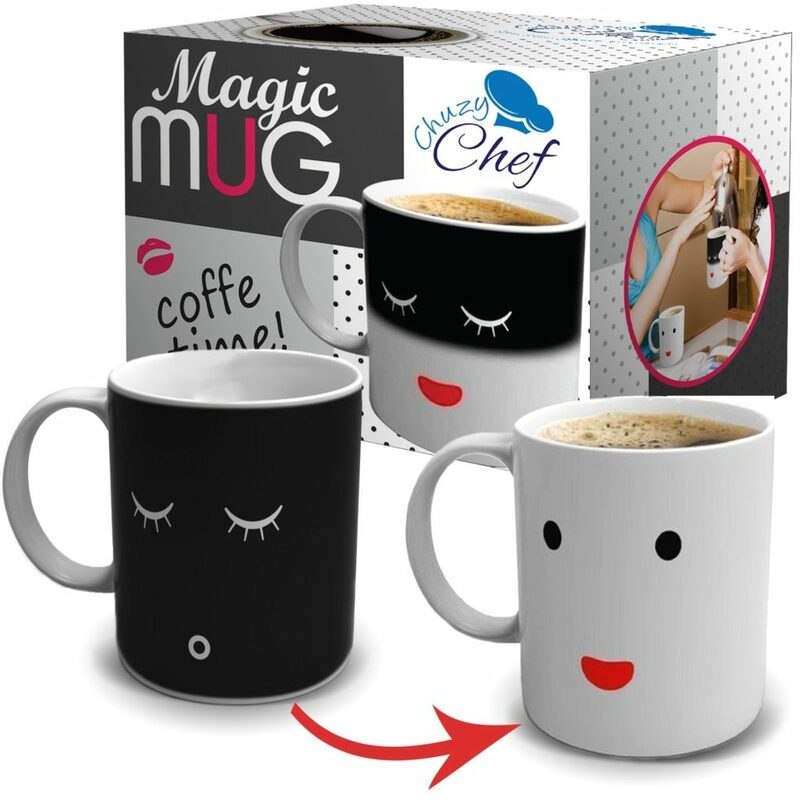 Before you pour the coffee in it, the mug is black and features a grouchy, sleepy face. Once you have your coffee in it, the color goes blue and the face becomes happy. Awesome, huh?! 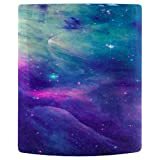 This color changing coffee ceramic mugs is perfect for star, Zodiac and coffee lover. Astronomy lovers will quickly realize this is their cup of tea… Or coffee. Literally. 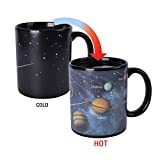 The empty mug is black colored and it features stars all over it, making it possible for you to star gaze in the morning. However, that’s not all! 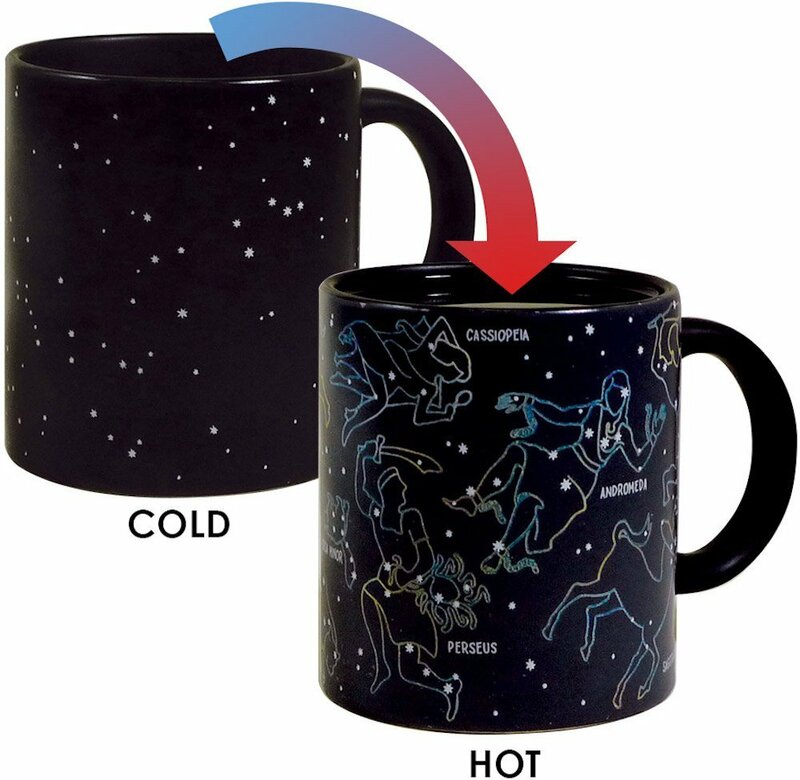 When the mug’s full of hot coffee, the stars create constellations, with their names included! If you’re looking for a romantic yet an interesting gift for your soulmate, you shouldn’t look any further. When it’s empty, this gorgeous cup features a young couple, while on the other hand, when you fill it, it shows a cute old couple in love. Is there a better way to express eternal love while drinking morning coffee together? This seemingly minimalistic black mug will turn into an awesome note to your loved one once you fill it with your favorite hot liquid. 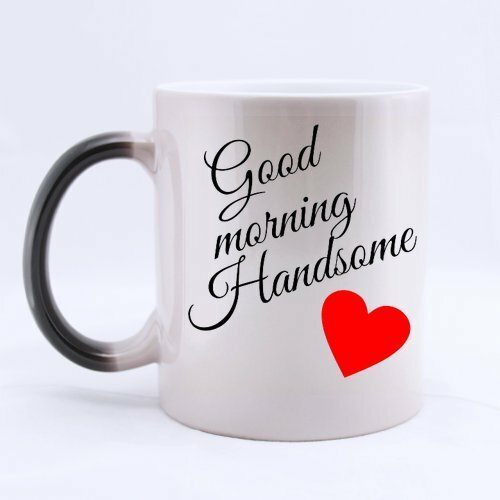 Who wouldn’t want to read „Good Morning Handsome“ every morning?! Durable and sturdy as it is, thiscolor changing coffee cups is a pretty nice gift with the capacity of 11 oz. This incredibly awesome magic mug will bring your coffee drinking ritual to the higher level, for sure. While you’re pouring coffee, the face on the mug will gradually turn from sleepy to wide awake, making your black mug become white. As your coffee cools off, the mug becomes black again, so you won’t have to deal with the unpleasant experience of drinking cold coffee. 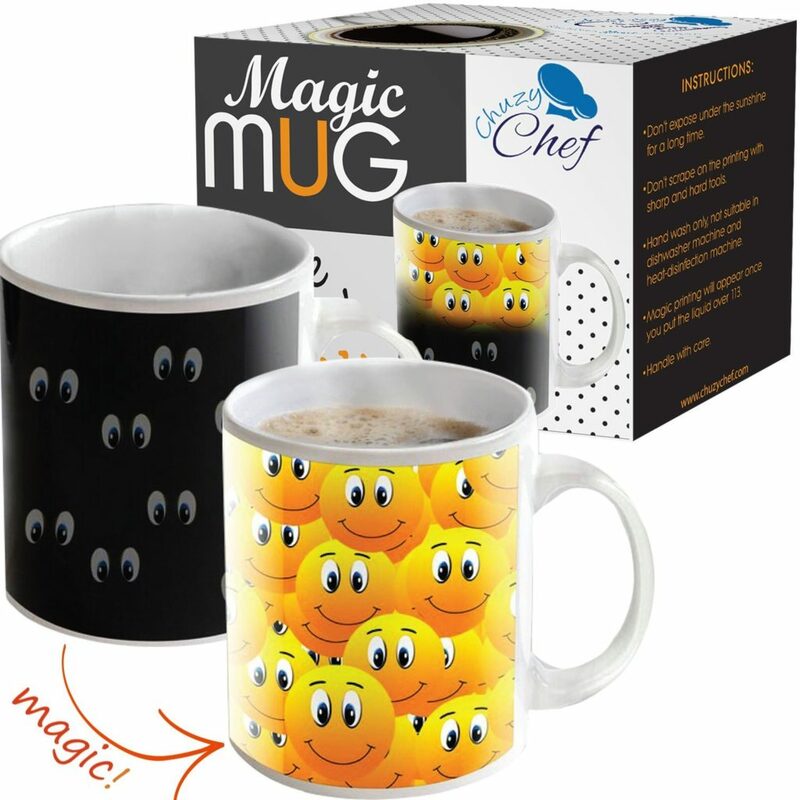 There’s no better way of cheering yourself up in the morning than waking up with the smiley faces on your awesome Chuzy Chef Mug! As you pour the coffee in it, the black mug with lots of funny eyes staring at you becomes a vivid colorful mug covered with orange smiley faces. If you like smilies on the walls of your mug but you’d like to stay away from the crowd, there’s also a mug featuring only one smiley face, spread all over it. It works pretty much as the previous one except the fact there’s only one couple of eyes peeking from the darkness when the mug is not full, and one funny smiley face spread all over it when you pour coffee into it. Packed in a modern gift box, this porcelain mug is a must-have for technology lovers. 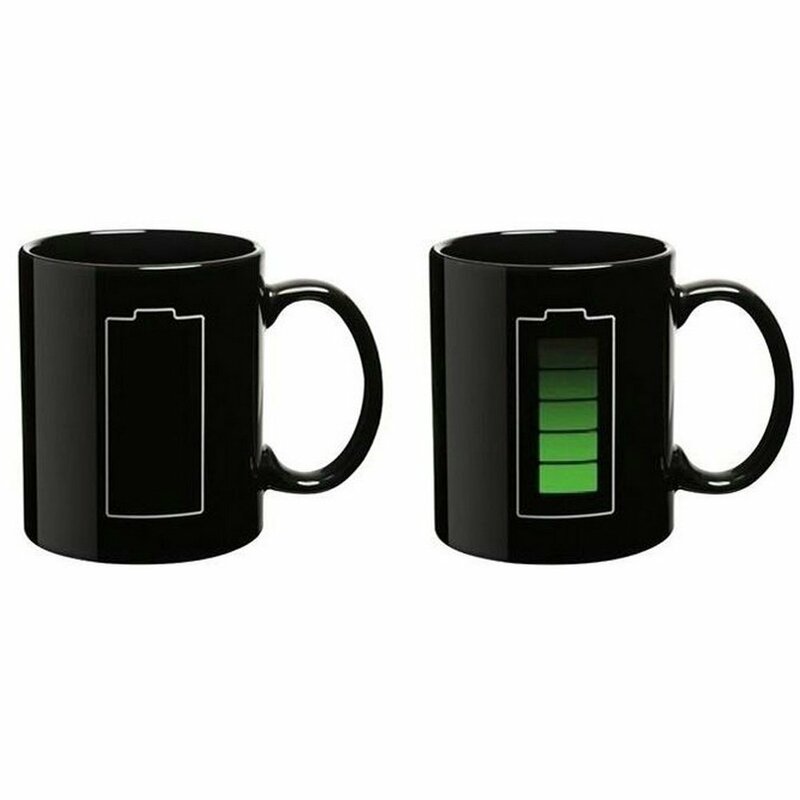 The empty cup shows an empty battery that charges as you pour hot liquid in it. The mug doesn’t change its color, it remains black both empty and full. Although it is a microwave safe mug, it is not recommended to wash it in a dishwasher. This mug is probably the cutest mug you’ll find on the market! 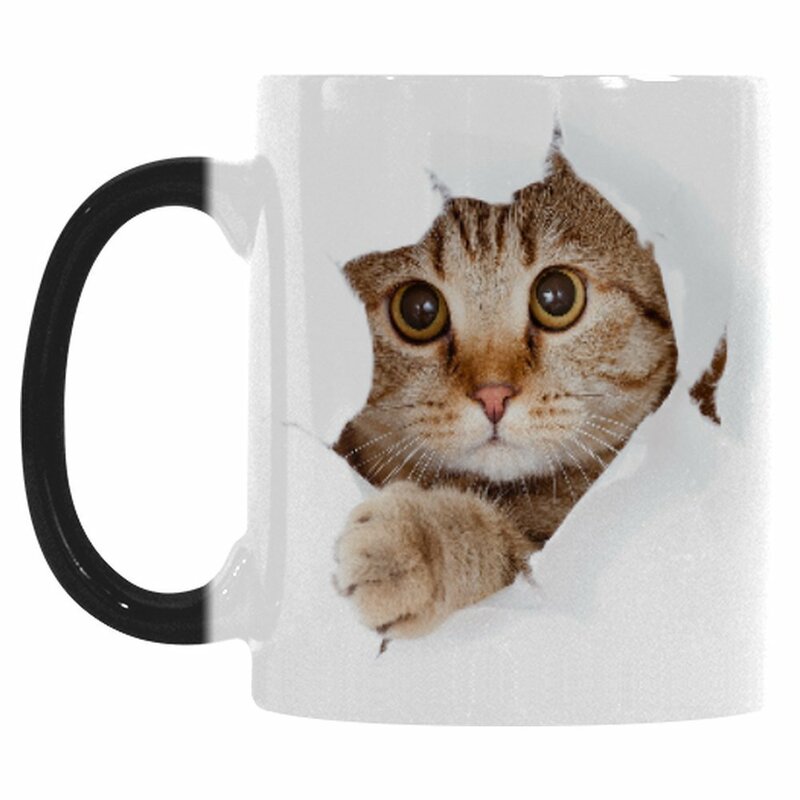 When there’s nothing in it, it looks as a simple black mug but once you sip your coffee in it, it changes its color to white and becomes the home of the cutest kitten that will melt your heart. Check other cute coffee mugs that we love. Star Wars addict will be more than thrilled to have their coffee from this ingenious mug featuring the lightsabers of numerous Star Wars characters, including Obi-Wan Kenobi, Yoda, Luke Skywalker, and many others! 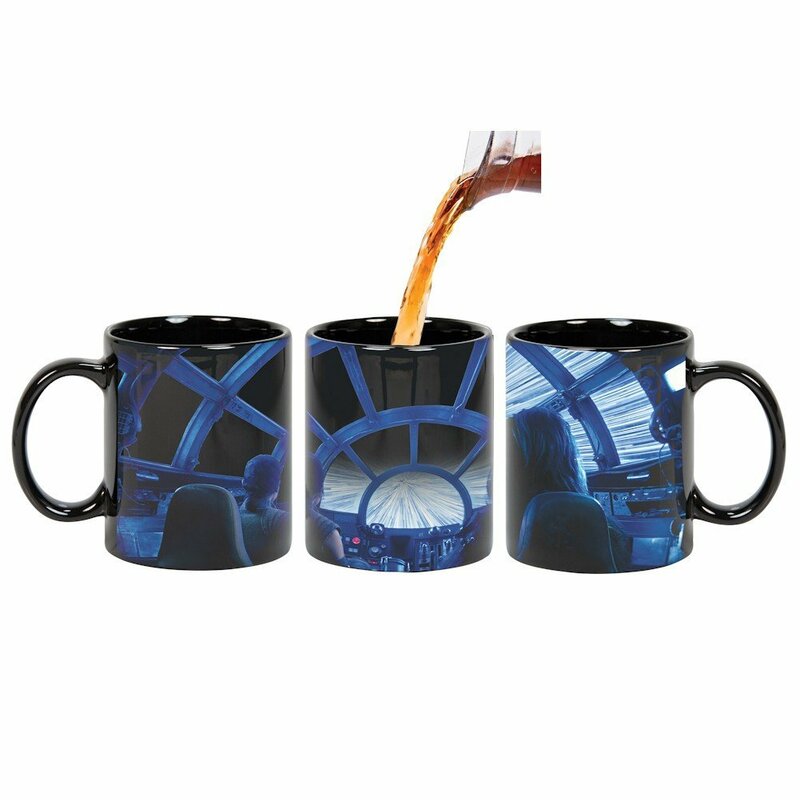 As you fill the mug, the lightsabers slowly light up, with the Force being with you as you drink your morning coffee. Its awesome desing makes this mug cool even when we observe it as a regular mug. It features a combination of green and white color and the world of dinosaurs. 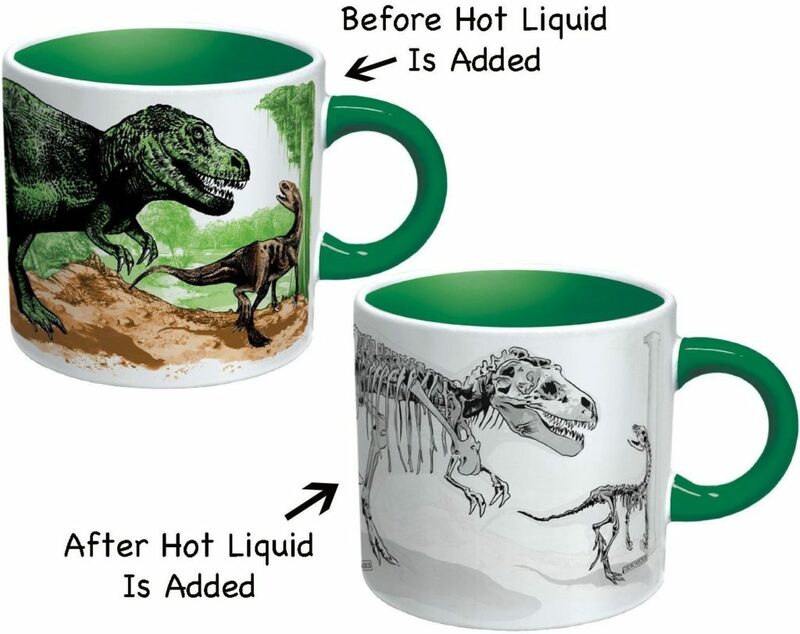 When there’s nothing in this mug, you’ll be able to see the fossils of the dinosaurs in a museum exhibition but once when you fill it, they become alive and located in their habitat. Another mind-blowing Star Wars mug comes from Chinese manufacturer Underground Toy and features Rey and Chewbacca blazing into hyperspace. When the mug is full, an array of light fills the cockpit and it takes you to another dimension as you drink your coffee. The mug is pretty large – Cit holds up to 20 oz of liquid. There’s no way of getting a mug for Star War fans but then completely ignoring the fans of Hogwarts. Holding approximately 11 ounces, this seemingly sophisticated mug goes fully Harry Potter once you sip your favorite hot beverage in it! It features a hilarious statement saying „I solemnly swear that I am up to no good“, and pretty cool graphics. 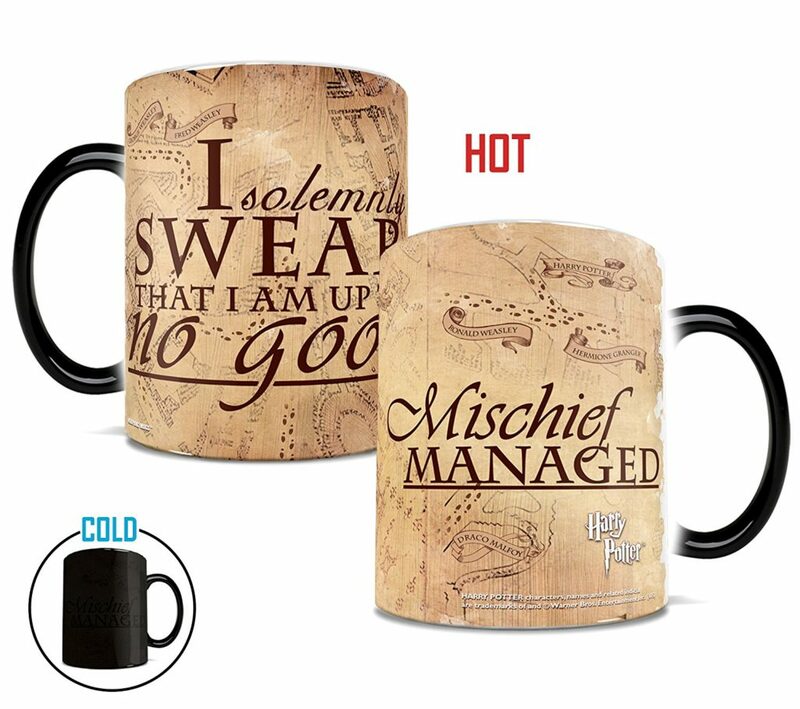 This heat sensitive Harry Potter mug is must have for all Harry Potter fans. This mug is another awesome changing color cup featuring only a couple of really sleepy eyes when it’s empty – this time on a white background. It completely transforms into eyes wide open once you pour your coffee in it. This mug shouldn’t be washed in a dishwasher nor used in a microwave. Even though this one may seem a bit creepy, if you really want to wake yourself up while drinking coffee, you may want to have it. 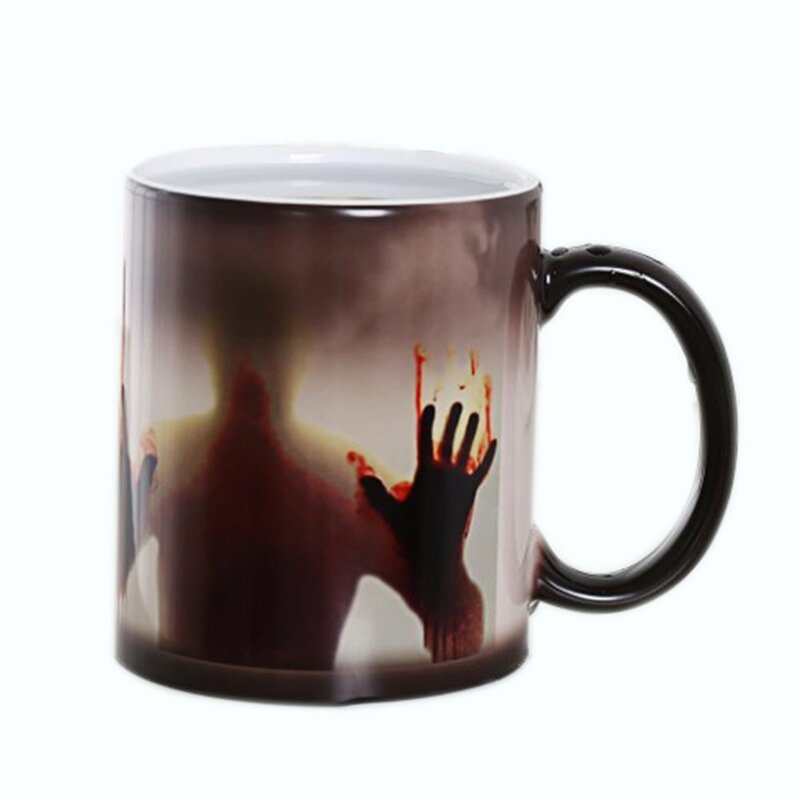 The empty mug is plain white, but as you pour your coffee in it, a silhouette of a man with blood on his hands appears. Wouldn’t it be a perfect prank gift? This gorgeous mug is the one the girls are going to fall in love with! 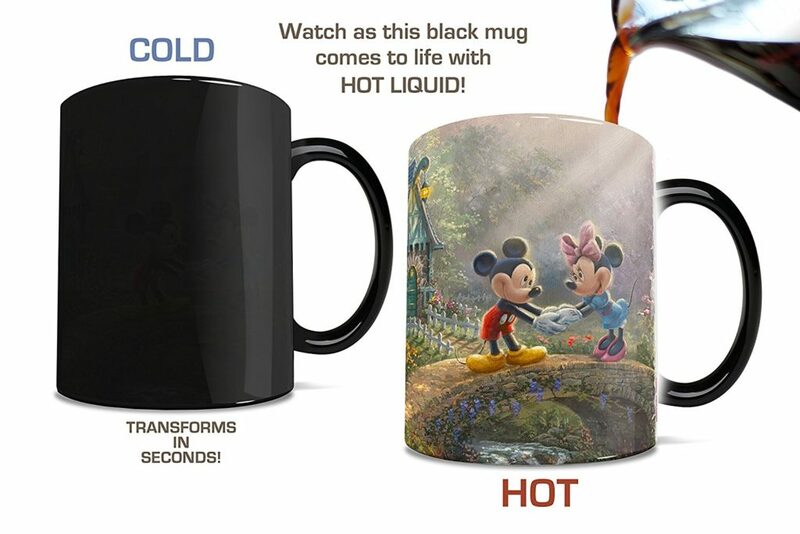 Black mug becomes Disney’s world once you fill it with hot liquid, featuring Mickey and Minnie holding hands at Sweetheart Bridge. The idea is beautifully visualized and the scenery is charmingly picturesque. If you’re looking for a perfect mug for your mom, this one really has all that she needs – the recognition of her hard work in the form of an especially cute thank you note. Not to mention how surprised she’ll get once she discovers the elegant minimalistic black mug gets the loveliest title when filled with hot liquid. Game of Thrones fans what are you waiting for? This ingenious mug is a real treat for all fans of Game of Thrones. 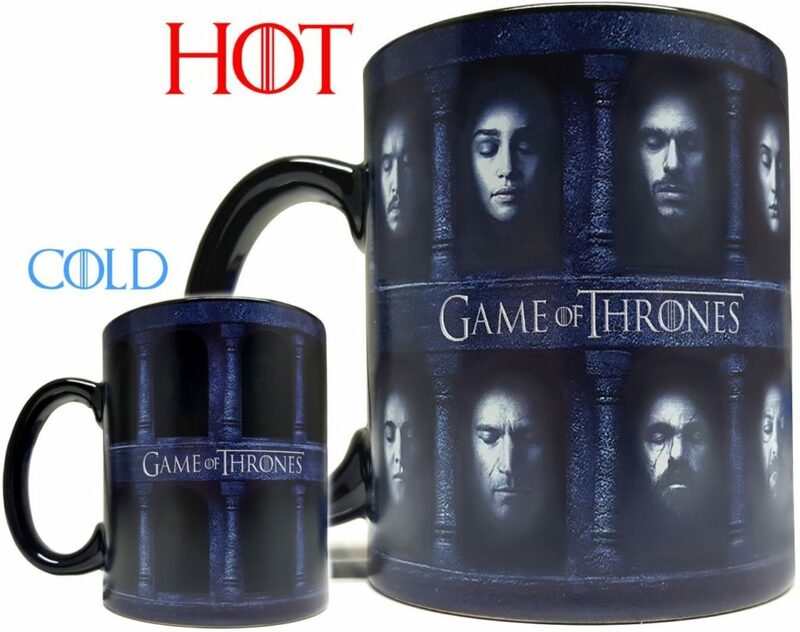 The empty mug features bars and a logo of the serial, however, when you fill it with hot coffee, in between the bars you’ll find the faces of your favorite characters. The quality of design definitely makes it a must-have item. If you’re into astronomy, you shouldn’t miss observing the Earth from space during the different stages of the day. Moreover, you can do so while drinking your coffee! The heat-sensitive technology will show you the detailed graphics and lead you through the day and night as the liquid cools. And there’s definitely no better sensation than having the whole planet waking up with you as you pour your coffee in the mug. Or is there? Magic cups where to buy? On Amazon. Why? Because Amazon offers low prices on this magic (heat activated) mugs. You can compage prices on Amazon and on other online marketplace but you can not find better deals than on Amazon. It Actually Cheaper to Order Most Products from Amazon. 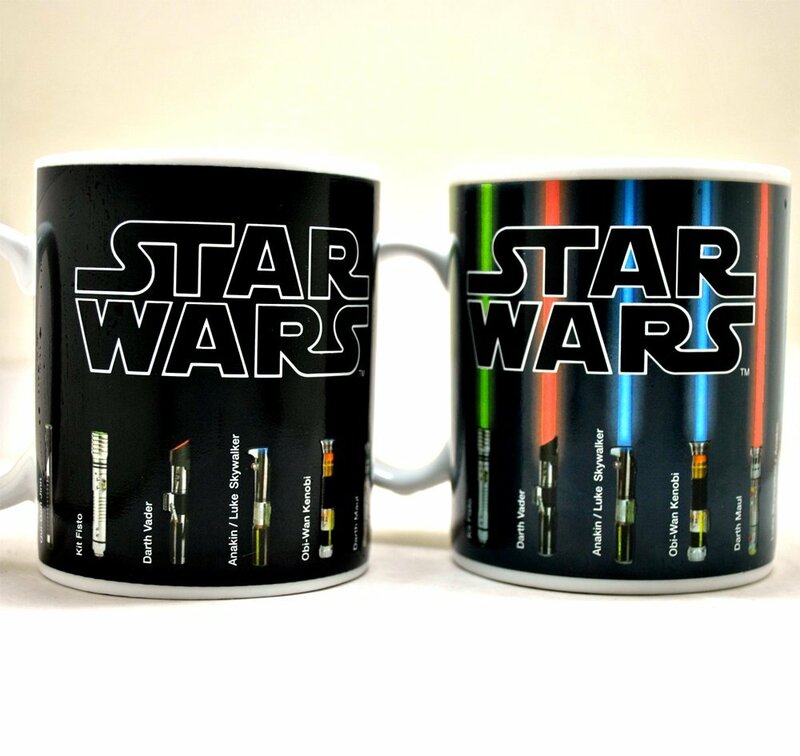 See the example of these Star Wars heat sensitive coffee cup and how that looks like when mug change color with heat. This is also one of the best selling heat activated coffee mug. Previous story Delonghi Dedica vs Gaggia Classic Comparison – Which Espresso Machine Is Better? how much it worth in pesos? can i write a name on it too?